Windows 8 explorer is one of the best explorer ever created by Microsoft in terms of Windows history. 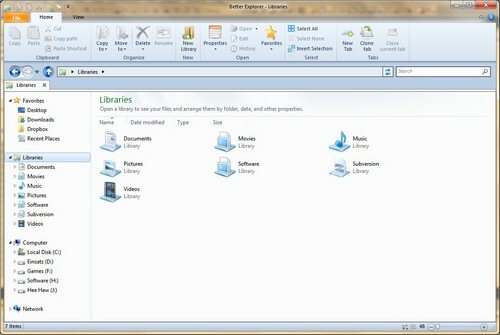 You can install this explorer in Windows 7 too by using Better Explorer only. This explorer, offers a tabbed interface ,like in Office 2010 and offers cut, copy and delete option like original windows 8 explorer. You can set it as your default explorer or you can use it as optional. Please note , it can be used in Windows 7, no support yet for other Windows versions. It is of 13.3 MB in size and it is free to use.